If you are experiencing constant hand pain, numbness and discomfort in your fingers, chances are you could be suffering from carpal tunnel syndrome. One in every five people experiencing such symptoms can be expected to have CTS. 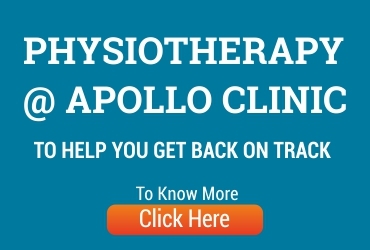 At Apollo Clinic, we provide a structured, multi-disciplinary approach to treating carpal tunnel syndrome. The standard skeletal structure of our hands is designed such that the carpal or wrist bones form a tunnel to give way to the tendons, ligaments and median nerve. The median nerve supplies sensation and movement to half our palm, thumb, index fingers and half of the ring finger. When this median nerve at the wrist joint gets compressed, it causes a clinical condition known as Carpal Tunnel Syndrome (CTS). Causes of CTS include repetitive movement of the wrist, swelling or inflammation of the ligaments and tendons in the carpal tunnel, stress, pregnancy, trauma, heredity, certain health conditions such as hypothyroidism, arthritis and diabetes. Symptoms of carpal tunnel syndrome include burning wrist pain, numbness or tingling in the fingers or palm, weak grip, loss of sensation in the fingers, immobility and swelling. Phalen’s manoeuvre is a particular test used to diagnose CTS. The dorsal side of both your hands will be compressed to each other for a stretched feeling. During the process, if you experience tingling and pain all through your elbow, you test positive for CTS. Rest Ice Compression and Elevation (RICE) – Ice helps relieve the pain. Compression is used to prevent further damage and to reduce swelling. Elevation, too, helps reduce swelling. Soft tissue massage – This technique involves direct physical action on the muscle and soft tissues. It includes a range of massage depths, pressures and durations. It aids in increasing blood circulation, relaxing muscles, reducing inflammation, decreasing muscle spasms and relieve muscle tension. Electrotherapy - This therapy involves the use of electric current to speed tissue healing. Splints - A wrist splint may be prescribed to be worn at night or in the workplace. It helps to immobilise the area and prevent further damage. Exercises - Different types of carpal tunnel exercises such as stretching, flexibility, motion, isometric and progressive resistance exercises may be used to treat CTS. Your physiotherapist will also advise and train you in activity modification so that you are more ergonomic in your day to day activities. Depending on the pace of progress, your therapist will design return to activity plans. We, at Apollo Clinic, understand the discomfort and pain caused by carpal tunnel syndrome and are fully equipped to treat the same. If you or a loved one is experiencing carpal tunnel symptoms, visit a physiotherapy clinic at the earliest. Our highly skilled and experienced physiotherapists provide the best care possible.